It starts with Sun-Woo reciting about the events happening in his life as he questions why is this happening to him; his father’s death, his friendship with Jang-Il, and the involvement of Chairman Jin. Then it’s followed by summary on Ji-Won and Jang-Il’s parts before ended with Sun-Woo’s vow not to forgive Jang-Il. The scene changes back to where episode 6 left us with: Jang-Il entering the room and looking at Ji-Won. He takes his seat besides Sun-Woo and continues to look at them while his presence remains unknown to Sun-Woo. The song ends and Sun-Woo claps for the wonderful performance. He invites Ji-Won for a cup of coffee later and looks towards Jang-Il’s direction, sending his friend into doubt. He then leaves, with Jang-Il and Ji-Won still inside the room. Jang-Il waits no more and starts inquiring Ji-Won whether Sun-Woo was the boy she talked about. He keeps pressing her about the issue and tries to force a kiss on her but soon stops. 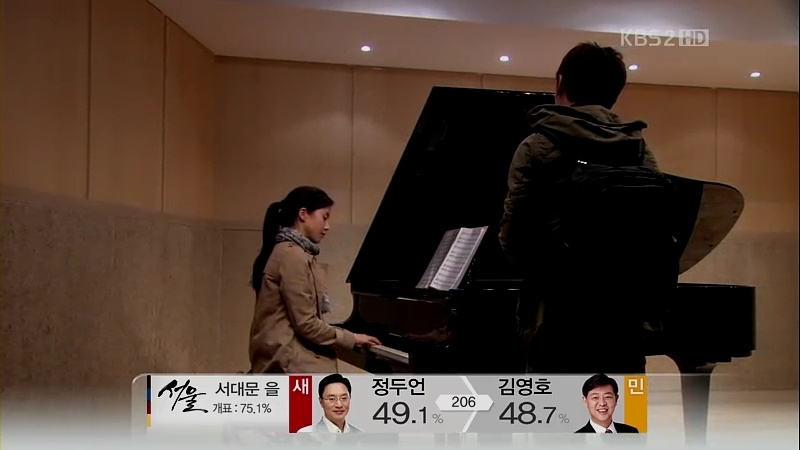 She walks out as Jang-Il stays in the room alone. He’s interrupted by someone who comes looking for Miss Heming. It’s Sun-Woo, who comes back to the room to find the clock he left behind. Jang-Il doesn’t say a word, but Sun-Woo knows there’s someone inside the room. He watches Sun-Woo as he tries to find the clock and spots it lying on the chair. Jang-Il picks it up and passes it to Sun-Woo. He thanks Jang-Il and walks out as Jang-Il stands there. It turns out that Sun-Woo has started to write down his thoughbut using a different way: Braille. He keeps thinking about things happening about him, totally engrossed in the writing process until Jang-Il comes into the room. He covers the paper but soon lets it to be seen, realizing that Jang-Il cannot understand Braille. Jang-Il maintains his friendly attitude in front of Sun-Woo and starts asking about the girl he had coffee with earlier, who was Ji-Won. He He wonders if Ji-Won likes Sun-Woo and knows that Sun-Woo likes Ji-Won too. Sun-Woo apologizes for staying in his house and Jang-Il says it’s nothing, but his angry tone is somehow heard by Sun-Woo. The letter written by Gwang-Chun has finally arrived at Yong-Bae’s house and as expected, he’s freaked out to find that someone knows about the crime he committed. The person asks for 30 000 Won for the secret to be kept silent so that Jang-Il and his life remains the same. He then goes out for a drink by himself but Gwang-Chun also goes to the same shop and have to share the table with Yong-Bae. He keeps drinking and appears slightly drunk. Gwang-Chun suspects it’s his letter that made him upset like that. He tries to invite Yong-Bae to have a meal with him while thinking the reason why Yong-Bae killed Kyung-Pil, but his friendliness makes Yong-Bae angry and leaves. However, he turns back when he hears Gwang-Chun says that he might become a murderer on that night if he continues to behave like that. Yong-Bae chokes Gwang-Chun in front of people in the shop but soon runs away when Gwang-Chun tells the owner to call the police. Sun-Woo gets ready to go out and he calls for Jang-Il. He thinks that his friend has already left for school, but Jang-Il still sleeping in his room. Sun-Woo makes a call to the police to actually ask for direction, alarming Jang-Il who overhears some parts of the conversation. 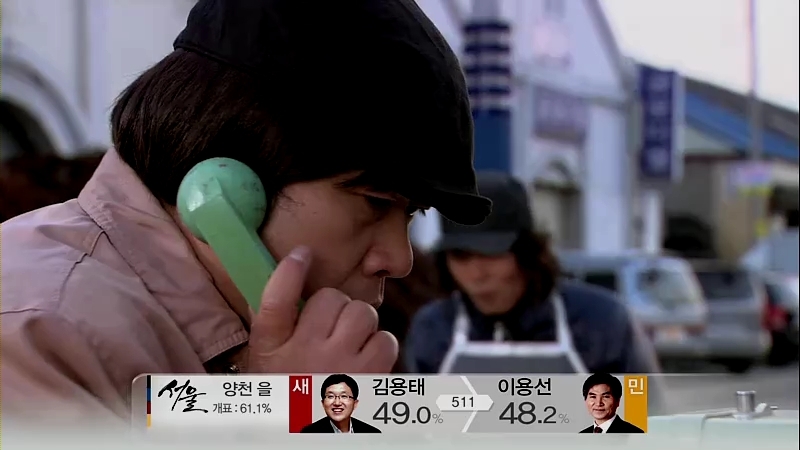 Sun-Woo then leaves and Jang-Il checks the call recording on the phone. Suddenly, Sun-Woo goes back into the house, causing Jang-Il to freeze on the couch. He knows that Jang-Il is there and Jang-Il has to respond to him. He coolly tells him that he called the police for direction and Jang-Il looks so scared while Sun-Woo somehow looks pleased. He leaves the house but Jang-Il chooses to follow him secretly. They arrive at in front of a building and Sun-Woo asks a man something that can’t be heard by Jang-Il. He decides to go back and walks alone in the cold weather. Yong-Bae shows the letter to Chairman Jin, but the man doesn’t want to help him. Instead he reminds him about Jang-Il and suspects Yong-Bae told someone else about what happened on that day. Yong-Bae strongly denies it and wonders if it’s Sun-Woo’s doing. Chairman Jin thinks the one who sent that letter probably needs money and agrees to lend his money for Yong-Bae to find out who’s that person is. Geum-Jool and Sun-Woo ride the bus to go somewhere. Sun-Woo starts asking about his hair and clothes like he’s going for a date. Hehe. 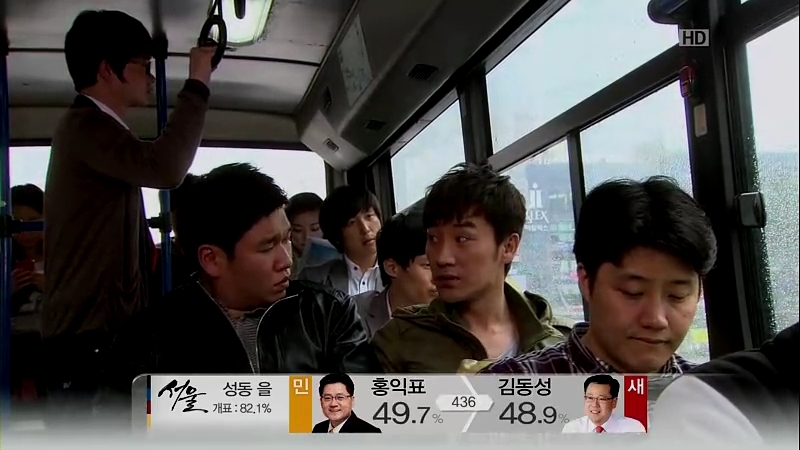 In the background, Ji-Won is reciting some verses from a novel. Sun-Woo goes to the rehab center and finds out that he has received a gift for being the top borrower of the month, which is tickets to an orchestra. He finds out that Ji-Won hur her throat because she tried to record too much novels for his sake. Sun-Woo then goes to a shop and Ji-Won sees him. She follows him but doesn’t say anything to him. He is picking a scarf for someone and when he begins describing the girl, she knows that it’s for her. She follows him around from a distance till they arrive at the center. He gives the scarf to Ji-Won and she’s so happy that it matches her so well. She invites him to go to the orchestra (she probably got it for being the top recorder of the month). She wants to meet earlier and have some coffee before going to the orchestra. Both of them smile happily to themselves. Geum-Jool and Sun-Woo return to Jang-Il’s apartment to find Yong-Bae there. Sun-Woo greets him awkwardly, but Yong-Bae treats him like nothing happened. Late, as they are sleeping, Yong-Bae snops around to check on Sun-Woo. He calls Chairman Jin to inform him that it’s probably not Sun-Woo’s doing as his handwriting is different from the letter. He assures the chairman that no one can suspect them. And Sun-Woo hears everything. On the day of the orchestra, Sun-Woo reaches the place first and Ji-Won is nowhere to be found. Suddenly, there’s an announcement informing that the show will be postponed as an accident has occurred, causing massive traffic jam. Sun-Woo tries to ask about the accident but no one answers him. Ji-Won is worried that Sun-Woo might wait too long for her, so she drops off the bus and starts walking to the place. They don’t see each other and ends up missing each other on their way. 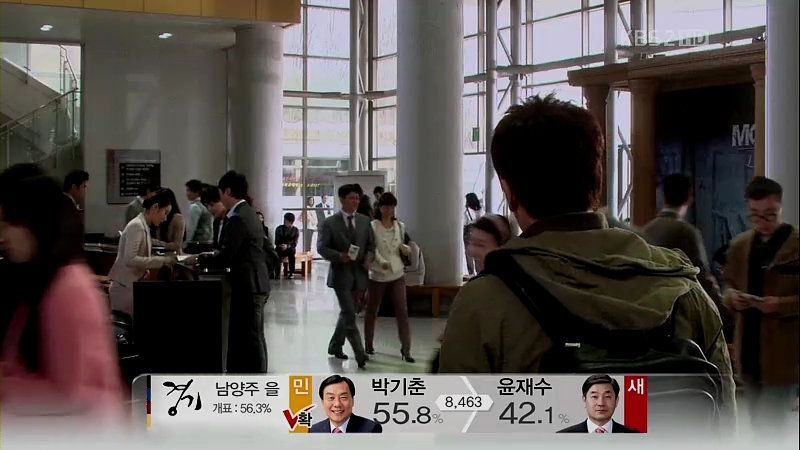 Ji-Won arrives there but the lobby is already empty. She tries to ask the people at the reception but they don’t see him. She then walks out, at the same time Sun-Woo is about to enter the place. Ji-Won sees him and calls his name. Sun-Woo’s face changes but he turns, facing Ji-Won. She tries to explain why she’s late but Sun-Woo drops his cane and walks towards her before pulling her into a hug. He’s so worried about her and asks for multiple of times before he’s assured that she’s fine. He doesn’t care if he’s to miss all the shows and pulls her into another hug. I pray that it won’t disappear like the dream last night. I look at you everyday. I hold your hand everyday. And I make sure you’re next to me. Even the wind that sits outside the window, is full of love. As the song goes on, they go for a date, cycling around the park like little kids. Sun-Woo goes to run across a field as Ji-Won screams to him, encouraging him to run with all his might. He then runs towards the wrong direction and Ji-Won runs after him and pulls him, causing both of them to fall onto the ground. Sun-Woo touches her face and admits that she’s prettier than what he thought. Chairman Jin gets another deal, probably from a foreign company. He gives a speech, saying how he’s never give up until now. His secretary receives a call from Yong-Bae, asking when he will return to Busan. We finally get to see Soo-Mi at her school, drawing a painting alone. A woman comes in, asking how did she qualify to represent their college in a competition. She thinks that her father made her a charm in order for her to get into it. Soo-Mi tells her to live her life in jealousy and the woman pours the water on her head. She goes home and stands outside, staring at the signboard. Gwang-Chun sees her and wonders what she’s doing there. 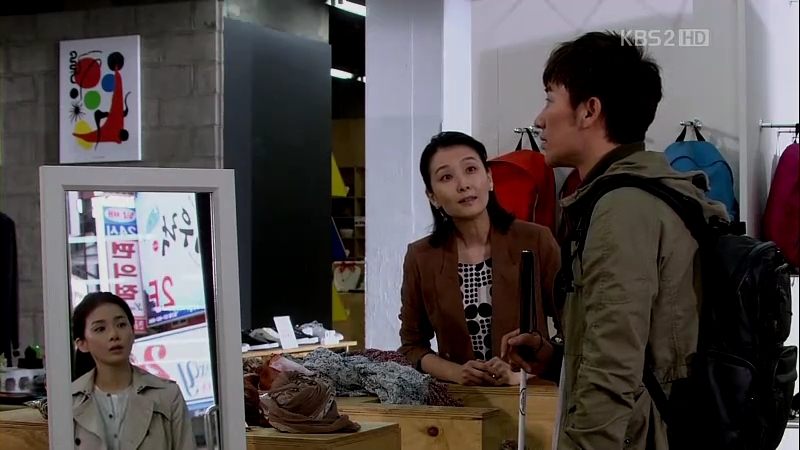 Soo-Mi tells him to bring down the signboard as he doesn’t have any customer and starts questioning about her fate. Her father sighs, saying that there’s no one that she can put her blame to. She suggests for them to have some drink. They start gulping down some alcohol in the house as Soo-Mi tells Gwang-Chun about the competition and the possibility of her going abroad if she wins. She wants her father to move to Seoul and change his name for them to start anew. They start arguing when he refuses to follow her suggestion and she cries, asking whether it’s really her fate to have him as her father and having to live her whole life by herself. He then agrees to do as she wishes and leaves. Soo-Mi cries as the camera pans towards her drawing of Jang-Il, now hidden behind another painting. Jang-Il receives a call at his apartment and turns out that it’s from Ji-Won, asking to talk with Sun-Woo. He eavesdrops on their conversation and goes to have a talk with Sun-Woo. Jang-Il is worrying about Sun-Woo, but he’s ready to face anything if he’s going to be hurt by Ji-Won later. The reason why Yong-Bae called for Chairman Jin earlier is because of the money. Chairman Jin reminds him to find out who the person is. Yong-Bae puts the money at the port and Gwang-Chun, already in disguise, goes to take the money. But then, he decides not to take it as Yong-Bae is watching the money closely. After some time, Yong-Bae retrieves the money as no one came to take it and calls Chairman Jin to inform him. Gwang-Chun overhears the conversation. He then follows Yong-Bae to the villa and watches as Yong-Bae puts the money inside the car trunk. Chairman Jin walks out of the villa and smiles at Yong-Bae, sending him signs without any words. Gwang-Chun witnesses it with confusion. Geum-Jool brings Sun-Woo to his new room. Sun-Woo tells Geum-Jool to go and not to worry about him, but his friend seems reluctant to let him stay there alone. He promises to come again soon and leaves. Sun-Woo sits in the room alone and falls asleep till it’s nearly dark. Ji-Won suddenly drops by to give him some good luck presents for his new home. She’s going to read him a book but the lights go out all of a sudden.The room turns dark and she doesn’t know what to do. Sun-Woo decides to read something as he’s always read in the dark. He recites a poem from a book. He can’t figure out the title as the book is an old one. She puts heart-shaped stickers on the cover and they stay in the dark. Outside the room, Moon Tae-Joo is there, having successfully located Sun-Woo’s whereabouts. He’s reluctant to let him stay in a place like that. He tells his assistant to give lessons to Sun-Woo and decides to leave as Sun-Woo has a guest. Gwang-Chun remembers the things he saw before and thinks Chairman Jin has something to do with the murder. He decides to write another letter to the chairman. Sun-Woo is taking a lesson about massage. He takes a rest in the locker room with Ji-Won.. She passes a mineral water to him and he holds her hand. He then massages her shoulder as he tells her that he’s going for a training. Ji-Won doesn’t want him to be a massage therapist but Sun-Woo wants to give it a try. She asks how the accident happened to make him blind He tells him that he got hit and she wonders by what or who, but he promises to tell her about it one day. He walks out with the truth about the accident in his mind. Chairman Jin receives the letter from Gwang-Chun. This time, he asks 100K Won from him. Yong-Bae reports about Sun-Woo to him and he wants Yong-Bae to kill Sun-Woo. Yong-Bae doesn’t want to commit any sin but Chairman Jin assumes that the letter will be sent to Jang-Il next. Yong-Bae thinks he can’t do it, prompting Chairman Jin to ask whether Yong-Bae wants him to kill Sun-Woo himself. Sun-Woo heads to a hotel as he recalls the tutor’s lesson about massage. He stops in front of a room and presses the bell. The door opens and Chairman Jin is there! SW greets him and introduces himself as a trainee therapist. Sun-Woo is in danger! Chairman Jin taking the matter into his own hands really means big problem ahead. I know he won’t get killed as he’s the main character, but still, I don’t want Sun-Woo to be hurt or anything. Ah, Moon Tae-Joo, why don’t you take him away as soon as possible? The sooner, the better. But actually, I’m still trying to figure out how his English-speaking assistant is going to teach Sun-Woo if he’s to do it. I think it won’t be an easy job..
My favorite part of this episode is actually Soo-Mi and Gwang-Chun’s sort of heart to heart talk. Both of them are actually fond of each other beneath the harsh words and treatment they give to each other. Due to the circumstances, I can see that Gwang-Chun has no other choice than being hated by everyone because of his job, even by his own daughter. He was quite persistent during his younger days, but he’s soften up a lot, probably because of his age. He’s indeed sad when he has to hear her complaining about their life and for him to comply to her request like that, he must be hurt a lot deep in his heart. I really want both of them to reconcile and for Soo-Mi to accept her father without any hate. Because they only have each other to lean on. Father-daughter teams are always the best! This was a great episode! It provided a lot of detail for the future and definitely is giving us the transition we need for the next time jump! The music so reminds me of Alfred Hitchcock theater with the dramatic transitions between scenes! I am now watching Resurrection because of this drama! I was so afraid at that scene when Seon Woo called the police. I thoght he would lie about it to Jang Il, but he was very smart. The directors prefer to show clenched fists in all dramas. 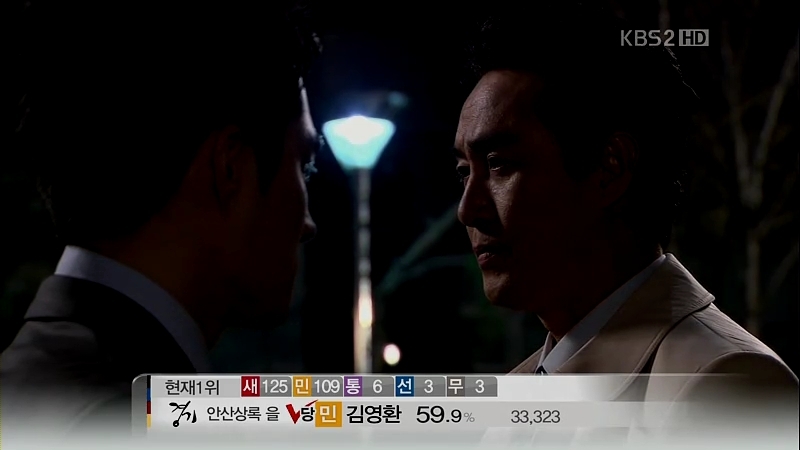 I was glad this time this scene was different too when Seon Woo heard the words of Yong Bae to the chairman. The phonecall of Ji Won in Jang Il’s apartment was the best scene. 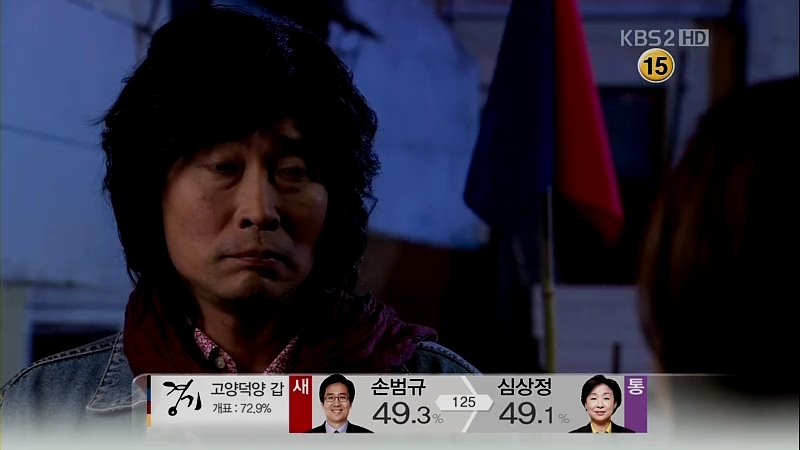 Poor Jang Il was about to explode. And suddenly he doesn’t want any more that Seon Woo leaves. Poor guy imagines that Seon Woo and Ji Won can be together happily in that apartment and than it’s better if he stays with him. I loved Resurrection, good luck with it! @newkdramaaddict: ohh now that you mention it, the time jump is really coming our way very soon..
@dabdi: I think SW likes to tease JI and put him in fear while he remains innocent and acts like he knows nothing. however, JI looks like he’s really reluctant to let SW out of his house. although it’s because of JW, I still find the scene quite touching at first, with him trying to persuade SW not to fall for JW. Guess I miss their friendship back when they’re still in high school..
It’s another unique feature of this drama when the director chooses to show the body language of the characters and even with a slight change in their expressions, we can predict what they are thinking. 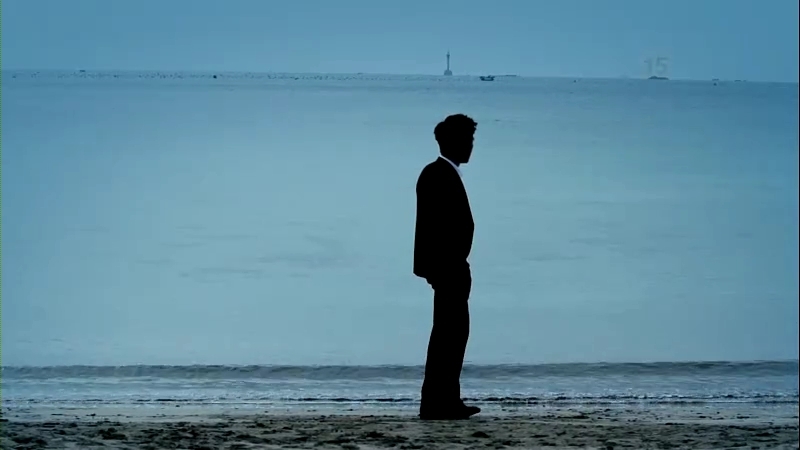 I’ve noticed that the director always takes the shot from one’s behind when the character is reluctant, like JI. There are multiple scenes where his back faces the screen, showing how he’s conflicted with his actions.